I have Graduated from Hindu college with good track record. I am preparing for UPSC. I believe in conceptual teaching. I start from basic and always ready to clear doubts. 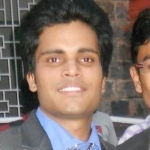 Did you find Krishna Kumar Sharma via LearnPick?